Submitted by Jeff Buster on Thu, 04/02/2009 - 14:21. 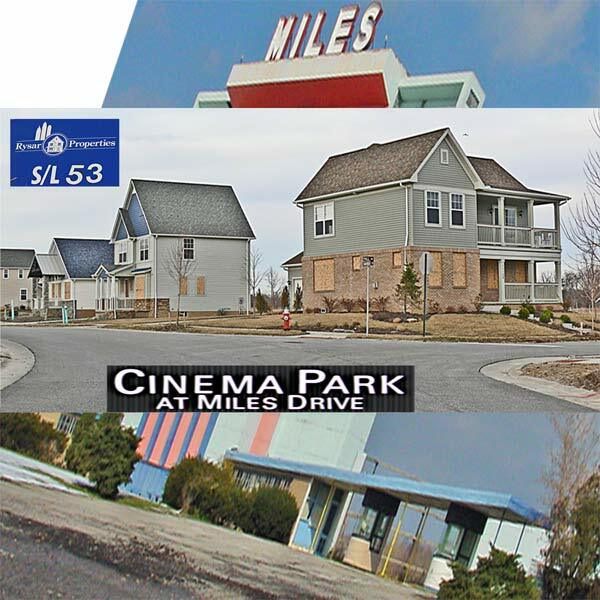 Miles Avenue Drive in Theater (of which I posted a photo on Realneo in 2007) – is history. The drive in location is now the surreal scene of a dropped-dead-in-its-tracks Rysar subdivision. There are about 15 completed houses on the circular new streets – almost all are boarded up. If any are occupied, I couldn’t tell when I drove through. The wind was the only life in the place. Why is it that in Cleveland we need these new houses when there are thousands of vacant and boarded up old houses? Taxpayers are paying to demolish the vacant houses, while developers like Rysar are building new houses and then boarding them up too. Is new house development the only field where money can (at least in the past) be made? There must be a million other ways for creative entrepreneurs who want to manufacture something to make a profit - why are we stuck on building new houses? Is that the only place were there's a gigantic jackpot? PS: If I was Rysar Properties and was developing this site, I would have kept the huge theater projection screen, and designed the roadway entry to the subdivision to go in through the old ticket booths(raise the horizontal roof). I would have oriented all of the living rooms to face the screen through huge windows. Then all of the houses would have had "home theater" of their choice on a rotating basis. Talk about wide screen HD! so thats where its gonna go??? Submitted by noner on Thu, 04/02/2009 - 17:08.
thats where our stimulus money is gonna go - to developers to build more of these? who the hell is gonna buy these things? I mean there's plenty of others - there's the near west 50ish development at fenwick that stopped dead in its tracks and just went on the auction block for a song, along with its neighbor, the old textile mill... Why is Jackson dumping all our fed stim money into the accounts of developers to create more? ps - we ended my daughter's 18th birthday here watching "South Park, the movie: in the back of my pick-up. "Sadam Hussein is Satan's whore!!!!" Submitted by Sudhir Kade on Thu, 04/02/2009 - 17:06. The idea is to be inclusive of the underserved via the Poverty, Work and Opportunity sphere - The ARRA manual is titled with six.